Learner at the Center. Teacher as Partner. Is your school moving toward personalized learning? With the proliferation of technology, it's getting easier to make personalized learning a reality. But it requires a cultural shift in the classroom that takes time, planning, and steady guidance. It puts learners at the center, where you guide them as their partner. Let Pearson Professional Development Services help you reimagine your classroom as a personalized, student-centered learning environment. We support the transformation with a guided step-by-step approach so you always have the guidance you need. What is personalized learning anyway? Personalized learning puts the learner at the center, Students have more choice and voice about learning. They "own" the experience, advancing their personal interests, knowledge, and thinking. but the teacher has a powerful role. the teacher is the spark, the coach, and the facilitator. The Teacher is a partner who helps learners meet grade-level goals. Technology supports the experience inside and outside the classroom. How do you change school culture? It doesn’t happen overnight, or in a single workshop or seminar. It takes a sustained, long-term effort. You need to rethink learner and teacher roles, engage staff and community, and make sure a solid technology infrastructure is in place. Whether you are making a one-to-one digital conversion or an instructional shift towards personalized learning, Pearson’s full suite of digital products and professional services and can help you through every phase of transformation. We start with a detailed analysis of your school needs, design a workable plan, and guide you through each hurdle. Explore topics by clicking the graphic. Explore topics by tapping the graphic. Ready to go? The Pearson Readiness Assessment analyzes your school’s culture, systems, and policies. We’ll consider your instructional approach, data flow, and technology capacity. A Pearson team works with you and your staff, compiling a detailed baseline report, We’ll review findings and help you define your intended outcomes. Once we assess your school’s readiness and vision, we’ll help design a plan that works for you. Our Program Design Service provides an experienced educational consultant for your school. Take the guesswork out of planning and put an expert by your side. Your Pearson consultant will help you dig deep and create a transition plan for long-term success. Technology makes personalized learning possible. Is your school ready for laptops, desktops, and tablets? Pearson Technology Services get you up to speed. From hardware to infrastructure, from bandwidth to system integration, we’ll support and guide you. It’s everything you need to know in language everyone can understand. How do you get everybody on board? What helps establish a shared vision of personalized learning? Pearson Change Management Services address the essentials. Focus on leadership, technology, teaching practices, and the learning model. We provide expert consulting, formal professional development, and job-embedded coaching and modeling. Write parents, meet parents, have conversations. Involve community leaders and business partners. Pearson Community Engagement Services help you build a wide base of support. We’ll work with you to create public awareness, organize events, and deliver clear information. Build a community of support. That’s how you change school culture. Are you making progress? Is all your hard work “working”? Pearson Progress Monitoring and Evaluation Services help you focus on measurable results and outcomes. We’ll work with you to analyze student data, document success, and identify areas of need. This is where we connect the dots between personalized learning practices and results. Commitment is not about short-term achievement gains. It’s about long-term sustainability. Pearson Sustainability Services provide coaching, strategy, and embedded consultants to keep you going strong. Build momentum, allow for flexibility! 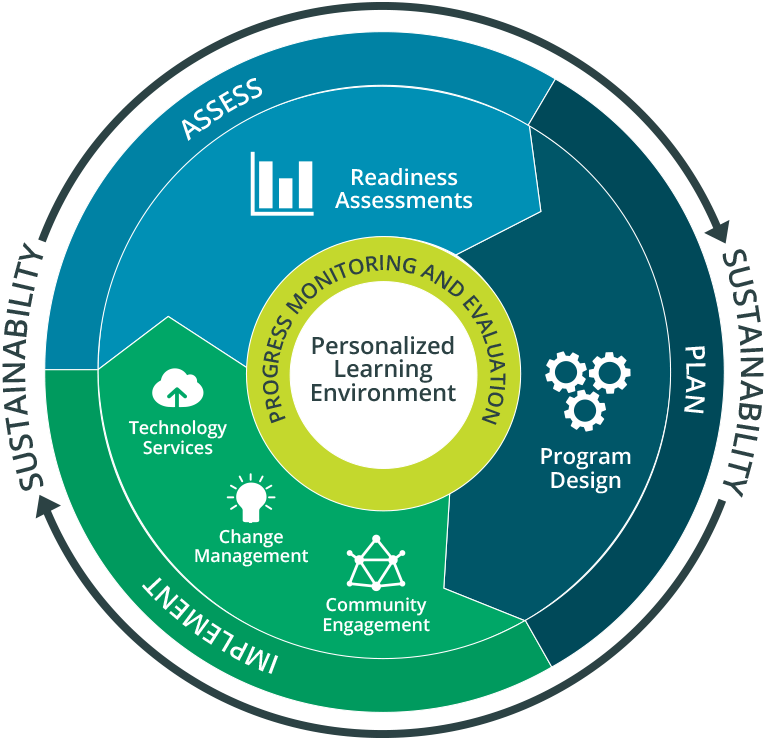 We’ll work with you to invigorate, adjust, and sustain your plan for personalized learning. Technology makes personalized learning more accessible. Is your school ready for laptops and tablets? Pearson Technology Services get you up to speed. From hardware to infrastructure, from bandwidth to system integration, we’ll support and guide you. It’s everything you need to know in language everyone can understand. Technology makes personalized learning possible. Is your school ready for laptops and tablets? Pearson Technology Services get you up to speed. From hardware to infrastructure, from bandwidth to system integration, we’ll support and guide you. It’s everything you need to know in language everyone can understand.